I've never put UV polish on my own nails before. Will I be able to get great results immediately? Most people who are savvy with using regular nail polish on themselves will take to the UV polish process quickly and easily. The GlazeMe UV polish is similar to regular nail polish, but of course there is a difference in the way the GlazeMe product behaves. For example, if you apply the coats too thickly it may appear wrinkled after curing process, or if you paint the sides of your cuticles or skin and allow it to 'pool', it will set that way. It's just a matter of learning to take your time with each coat being applied, until you are used to it. We have had many first timers test out our products, and as long as you are aware of what NOT to do (i.e. please read all of our FAQ's), there's not that much to it, and practice makes perfect. Can I use a regular nail polish together with the UV top coat? No, regular nail polish does not have the wearability of GlazeMe UV polish, and should not be mixed with UV gel polish. Only use GlazeMe UV polish with GlazeMe UV polish. Does GlazeMe UV polish damage nail health? Due to the long wearing capability of UV nail polish it can help protect nails and allow them to grow without breaking as easily. Whilst the GlazeME UV product may not be suitable for everyone, it should not impact nail health if applied and removed properly. How does GlazeMe UV polish compare to other products? In our opinion, GlazeMe UV polish is one of the best overall products on the marketplace without the expensive pricing of some brands, but with superior results to some of the cheaper and less effective brands on the market. How long does the GlazeMe polish last? The GlazeMe UV nail polish can last up to 14 days with proper application. How much coat or polish should I apply to get the best results? For best results always apply a thin and even layer of each coat and closely follow the instructions provided on our how to page. How many Mls is each polish? Each GlazeMe polish is 7mls. What is the GlazeMe UV polish liquid form most similar to? The type of liquid fluid and the way that it goes on is most similar to nail polish. Can the GlazeMe UV polish be used on toes? Yes the GlazeMe UV polishes can be used on toes in the same application manner as for finger nails. Does GlazeMe UV polish have a scent? The coats and polishes have a very slight scent but are not as noticeable as standard nail polishes. Does the UV LED lamp come with a warranty? All UV LED lamps purchased through GlazeMe come with a 12 month warranty. For further details please view our warranty page. All lamps sold from our store come standard with Australian plugs and run between 200V - 250V and may require an adaptor or convertor depending on country of use (outside of Australia). What are some of the properties of normal nail polish, gel, UV nail polish? To meet the demands of the busy beauty-savvy woman who wants a long-wearing polish, the nail industry has recently released various types of nail polish systems that can make your polish last much longer than a regular nail polish. Commonly referred to as long-lasting, “no chip”, hybrid or gel manicures; today many different products are available on the market. Our beautiful range of GlazeMe UV polishes use gel properties in the form of a thin nail polish which cures under a LED UV Light and lasts up to 2 weeks. We currently have 59 gorgeous colours, with more exciting shades to be released soon. What colours do I use for a French manicure? Both #1 Cotton and #26 Snow Flake are great to use for French tips. The only difference is that Cotton is a slightly more opaque/thicker white colour. For the French base, our favourites are #13 Fairy Floss, #2 Glass Slipper and #4 Cherry Blossom. Apply the base coat and French base colour (one or two coats as per your preference) – curing as normal. The curing MUST be completed as per our how to instructions. Apply the French tip. If you need to tidy the line of the French tip, you can simply use an ISO wipe to remove any excess, without interfering with the base layers. What is the estimated time of delivery and how much is the posting and handling? Packaging and shipping is calculated at checkout. Packaging and shipping is calculated at checkout and sent via Australia Post. Orders are generally processed the same or following business day following order receipt. Most packages are delivered within 1 - 3 business days following, however rural and non-metro areas within Australia may take longer. Parcel deliveries containing acetone* are shipped via road and generally take 3 – 8 business days depending on location. *Acetone must be sent via road transport to comply with Australia Post regulations for the transportation of flammable liquids. Packaging and shipping is automatically calculated based on the destination country location and size of your order. Orders are generally processed 1 - 2 business days following order receipt. Most packages are delivered within 1- 2 weeks following but this will be heavily country dependant. Please note that pure acetone cannot be shipped via air and, therefore, cannot be shipped overseas. If your order address is outside of Australia and you’ve ordered a kit or pack that contains acetone, then your bottle of acetone will be automatically swapped for 75 isopropyl wipes. Lastly, unless you select tracking and insurance as the postal option, we are unable to provide tracking details for your order. I am ordering the GlazeMe product for a gift. Do you offer gift wrapping? Yes, we offer gift wrapping on all orders over $40. If you would like your order gift wrapped especially, please highlight this in the comments section in step 5 during the checkout process. 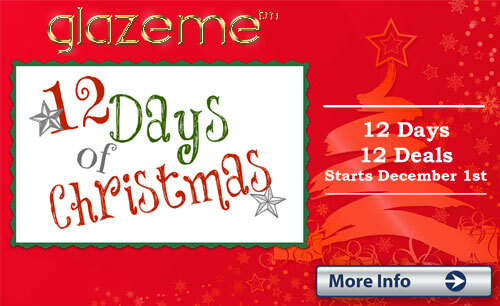 Our gift wrapping includes a Glazeme.com.au branded white box with black ribbon. Can I use nail polish remover to remove the GlazeMe UV polish? In order to remove the UV polish effectively you should use pure acetone along with the instructions in our how to section. You cannot remove your UV polish with normal nail polish removers. How long does it take to remove the GlazeMe UV polish? It takes approximately 10 - 12 minutes for the entire process if you are following the instructions in the how to section. Why is my GlazeMe UV polish not lasting as long as it should? There are a number of factors that determine the length of wear of your GlazeMe UV polish. Nail preparation is very important to ensure the best base is created for long lasting wear. Secondly is the type of lamp you use, not all lamps are created equal. Finally the manner in which the polish is applied - for best results paint an even thin layer of application and closely follow the instructions provided in the how to section of our website. Why does my UV polish in the bottle seem thick or gluggy? The coats and polishes are very sensitive to UV light / sun light and should therefore be kept in a cool, dry and dark space otherwise they may begin to cure and thicken up in the bottle. Always ensure that you replaced the lid of each bottle securely during and after application. If you believe the polish is faulty, please take a photo of the faulty product, (preferably once applied), and send it to enquiry@glazeme.com.au. We will organise a solution for you as soon as possible. I’ve purchased a colour, however, it’s not the colour I thought it was. What do I do? We are happy to exchange the colour for you. Email us at enquiry@glazeme.com.au within 14 days of receiving the order and confirm which colour you would like to return and which colour you would like us to replace it with. Check out our returns policy for more information. The order I have receive does not match my order. What do I do? While we take every care with packing your order with love, we are only human. If you haven’t received something or you have received the wrong item, please take a photo of what you have received, (preferably in the box you received your order in), and send it to enquiry@glazeme.com.au. We will organise a solution for you as soon as possible. I have received my GlazeMe.com.au order, however, I have changed my mind. What do I do? Here at GlazeMe we realise that sometimes people change their mind about a purchase. We offer a 14 day refund money back guarantee. Check out our returns policy for more information. I believe I have a faulty lamp. What do I do? Here at GlazeMe we test all lamps prior to sending them out and pack them securely to ensure the product arrives to you in working condition. We are aware that sometimes during transportation parcels may be treated roughly and cause damage to the contents. Or perhaps you’ve had the lamp for some time and it has started playing up. If this has occurred, please email us at enquiry@glazeme.com.au to organise to have the unit inspected and either repaired or replaced. For more information please see the warranty details.